It seems most people think creating a life is a morally neutral thing to do while destroying one is terrible. This is apparently because prior to being alive and contingent on not being born, you can’t want to be alive, and nobody exists to accrue benefits or costs. For those who agree with these explanations, here’s a thought experiment. You are sleeping dreamlessly. Your friends are eating a most delicious cake. They consider waking you and giving you a slice, before you all go back to sleep. They know you really like waking up in the night to eat delicious cakes with them and will have no trouble getting back to sleep. They are about to wake you when they realize that if they don’t give you the cake you you will be unconscious and thus unable to want to join them, or be helped or harmed. So they finish it themselves. When you awake the next day and are told how they almost wasted their cake on you, are you pleased they did not? If not, one explanation is that you are a temporally extended creature who was awake and had preferences in the past, and that these things mean you currently have preferences. You still can’t accrue benefits or costs unless you get a bit more conscious, but it usually seems the concern is just whether there is an identity to whom the benefits and costs will apply. As an added benefit, this position would allow you to approve of resuscitating people who have collapsed. To agree with this requires a notion of personal identity other than ‘collection of person-moments which I choose to define as me’, unless you would find the discretionary boundaries of such collections morally relevant enough to make murder into nothing at all. This kind of personal identity seems needed to make unconscious people who previously existed significantly different from those who have never existed. It seems very unlikely to me that people have such identities. Nor do I see how it should matter if they did, but that’s another story. Perhaps those of you who think I should better defend my views on population ethics could tell me why I should change my mind on personal identity. These may or may not help. This entry was posted in 1 and tagged ethics, identity. Bookmark the permalink. What’s wrong with according moral significance to ‘collection of person-moments which I choose to define as me’? I think unconscious people are morally very different from the non-existent. If you murder someone in their sleep, for example, you will (typically) be interrupting and thwarting their half-complete life projects. If you merely fail to bring someone into existence, no such interruption occurs. Also, why think that people no longer have preferences while they’re asleep? It’s not like our brains are wiped and then restored each day. The same info stays there all along. As far as I know there is nothing wrong with according moral significance to anything you like. You seem to have written before that ad hoc preferences are irrational: http://www.philosophyetc.net/2007/09/examples-of-irrational-desires.html. I wouldn’t go that far, but that seems very close to saying that arbitrary features shouldn’t be morally significant. Perhaps the boundaries one applies to a bunch of person moments don’t seem arbitrary – there is usually an obvious choice. But they are arbitrary in that they could very easily have been somewhat different, and that they are chosen for convenience of thought, so there is no obvious reason they should also align with something fundamental about value. It seems mostly when people argue that non-existent people can’t have value, they mean CAN’T, not ‘I don’t value them’. And they think that they can’t have value because of some real feature of identities that doesn’t allow the possibility of value unless a person has been existing for a bit. This seems bizarre to me on its own, but it seems even less likely that such a constraint on the possibility of value would arise from my making conceptual boundaries around things, without my knowing it. I can’t see any such logical implication of defining people, so where would such a thing come from? Why are half complete life projects more important to complete than incomplete life projects? They are cheaper to complete, but that should be taken into account in any normal cost benefit analysis with no attention to identities. Yes, the info about your preferences remains in your brain while you sleep, to some level of accuracy. So it does when you are dead, for a while. So does much information about your preferences prior to when you are conceived. Is stored information about what your preferences would be in other circumstances really all you need to have preferences? As an occasional advocate of radical antinatalism, I should have an opinion about this essay, but the central analogy bears so little relationship to what’s actually involved in creating a life that I cannot be bothered trying to decode the argument. Maybe if there was a horrible poison in half the cake slices. Ok, say there’s a horrible poison in the whole cake. Should we wake you and force feed it to you anyway, since you don’t presently have any preferences about it? It seems very unlikely to me that people have such identities. Nor do I see how it should matter if they did, but that’s another story. At a minimum, I would argue that the ‘collection of person-moments’ are connected by something more clearly defined than merely choosing those particular ones as you. There are specific types of transformation of person-moments that naturally occur with the progress of time, so you can identify the collection of person-moments between which the difference is only those types of transformations as a meaningful collection. I don’t think such a definition is particularly arbitrary, as it will tend to identify naturally occurring clusters in person-moment-space or file-moment-space that are very common, and the majority of the time are separated by large, unoccupied areas of the respective spaces. Yes, many smaller things have relationships between them that make it convenient to conceptualise them as larger clumps. The choice of how to group them is not arbitrary in that it is generally chosen for the convenience of some activity, such as predicting the behaviour of humans you come across repeatedly. However there is still the choice of what characteristics you care to group them by. That a grouping chosen long ago for some bunch of important practical activities would automatically coincide with some basic feature of moral value is not self evident. The interesting thing to me is the non-linear way that life is valued as a function of age, from that point of view. I think most people would agree that the loss of an average 4 year old is felt to be worse then the loss of an average 70 year old, or even 40 year old. But it’d be hard to argue that the death of a 4 year old is, for example, ‘interrupting and thwarting their half-complete life projects’. It’s also arguable whether the 4 year old themselves even value their life all that much. Many people and industries seem to believe that 25 is when the value of one’s life begins to trump other values. The value of a baby spikes at some point from the time of conception, but it is not very clear what objectively changed in terms of the potential value of the person. The main thing seems to be just the cost of investment of the pregnancy, but that doesn’t feel like enough to account for the sharp increase in value. I think you give far to much credence to the proposition that people think through and decide on their moral code. I suggest that the vast majority of our moral “beliefs” are not beliefs, but are instincts, crafted by evolution. A tribe has finite resources. If there were sufficient resources 10 years ago to bring a new person into existence, and those resources were already spent, then having the person die today is a tragedy for the tribe and for the genepool. If, on the other hand, resources exist today to bring a new person into existence, if one couple does not have a child, another couple probably will…or the resources will still be there next spring. In short: I argue that the intuitions we have are exactly those you’d expect evolution to give us. I agree that most beliefs are not the product of extensive thought. However common instinctive beliefs may be changed by imposing thought on others, because at the very least humans naturally avoid embarrassment from too blatant hypocrisy or from evidence of intellectual weakness (I expect many people also have higher motives for changing their beliefs when they get around to thinking about them). The philanthropic antinatalist asymmetry only holds that the absence of pleasure is merely neutral if no one is thereby deprived. I agree with Mitchell Porter that a sleeping person is not a very good model for a non-existent person, if this is the question we’re trying to get at. Another key problem with your analogy is that the cake eaters know the values of the sleeping person ahead of time. The issue is whether you have preferences, as non-existence is supposedly relevant because it prohibits you from having any. If you think a person has preferences while they sleep dreamlessly, how about a person in a coma? One who has ‘died’ but is later resuscitated? One who has ‘died’ and could have been later resuscitated but wasn’t? One who is dead? The cake eaters know what the person’s values will be if they become conscious. Similarly, we can guess what the values of a nonexistent person will be if they are brought to life, at least to a great degree of detail, just by knowing they are a person. The problem with the analogy is that the person is going to eventually wake up regardless of the cake. 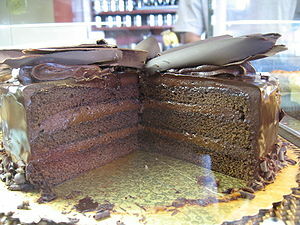 2) consciousness with delicious cake experience. 2) no consciousness at all ever. 3) to not believe #1, one must also not believe #2. I disagree with all three points. Number 1 seems self-evidently false to me; in other words, it conflicts with the sense of morality that evolution has given me. In addition, reasoning intellectually, I don’t see that anything else I believe contradicts what my morality tells me here. Re number 2: I am confident that ‘collection of person-moments which I choose to define as me’ is in fact not a valid notion of identity. Such a notion could admit a definition of “me” as all of the person-moments of eddie and Katja, or of eddie and a rock. I submit that such definitions are nonsensical, irrational, and invalid. In addition, the notion is of no use. It has no explanatory or discriminatory power: you cannot use it to determine what some other person’s identity is, nor can two people use it to agree on what anyone’s identity is. It is equivalent to the notion “the identity of this rock in my hand is whatever chunks of matter I choose to to define as the rock”. Such a definition of identity is no definition at all. Re number 3: Even if you believed that a person’s identity was whichever set of person-moments they chose it to be… or perhaps whichever set you chose it to be (I’m not certain which of those two you intended here) … you could still believe that no one’s identity can encompass any person-moments of people who don’t exist, because people who don’t exist don’t have person-moments, any more than rocks that don’t exist have mass or color. And if you so believed, you would still conclude that people who are unconscious, or dead but revivable, are different from mere hypothetical, imaginary, potential people who do not exist and who have never existed. Also: I’m still unable to parse “unless you would … nothing at all”, both grammatically and philosophically. Could you explain what you meant there a bit more? You are right about my claims. 1) What do you think a preference is? Can dead people have them? 2) I’m not sure what you mean by ‘not a valid notion’. You can define some term to mean all the person moments of you and me if you like. As you note, it would not be all that useful, which is probably why you don’t. That people invent definitions is what ensures they are useful. The real world has a huge number of characteristics varying all over the place and countless ways bits of it could be categorized. Presumably when i am choosing which person moments to call me, I have some purpose in mind for this concept – probably that it will be something I care a lot about. But there is no reason that the same characteristics should define what I consider to be myself and what you do. Nor is there any reason what I care a lot about should be the same thing as what I am legally responsible for the actions of. If you have some purpose for the definition, you might pick a useful one. There is not some inherent definition out there in the world. ‘Determining what someone else’s identity is’ is an empty quest unless you mean something in particular by ‘identity’ to begin with. If you meant ‘what they refer to when they say their name’ then you are asking something different to ‘what will come along if I drag their arm’. But it is pointless to wonder which of these is the correct interpretation of your question. 3) Then nobody can include person-moments they would naturally think of as their future person-moments in their identity either. = you may believe that ‘me’ is an inherently blurry concept defined by the social and psychological convenience of the moment rather than some deep inherent unity, and still maintain that this concept should also determine the moral worth of future person-moments (nothing if they don’t share an ‘identity’ with a current person-moment, lots if they do). If you take this position, this will lead you to unintuitive conclusions. For instance suppose your society were to develop a habit of identifying people who have completely lost their memories as different people to who they were. Then you would as happily kill someone as have them lose their memory, and would have no grounds to ever object to killing people who would become this way. If on the other hand your society identified them as the same person, you would fight on the side of their moral value. So the choices society makes for unrelated practical reasons would make a murder into no offense at all according to your view. In this context, preferences (utility functions, values, etc) are attributes of people, and my moral intuitions tell me I should value the preferences of other people. The tricky part is determining what people are. I am. You are. Rocks aren’t. Amoebas aren’t, and dogs probably aren’t either, although I’m not entirely settled on that point, and I’ll worry about the status of AIs and aliens when I meet them. For now, I’m reasonably content to draw the line at “human”. What about “dead human”? Nope. As you mention elsewhere, dead people aren’t actually dead people – they’re lifeless hunks of decaying organic matter, and the people they resemble no longer exist. When they were alive, they were people, and they had preferences. Now they aren’t and they don’t. However, when they existed, those people may have had preferences about the then-future / now-present. Preferences like “If I die, please resuscitate me.” Or “Continue sacrificing portions of your harvest upon an altar in my name.” My moral intuition tells me that some degree of deference to the former preferences of former people is due, although it’s not absolute, and there’s various squishy parameters that I’m reluctant to try to concretely specify. Intellectually, I can see some hand-wavy game-theory reasons to commit to respecting the wishes of the deceased. I suspect we should probably do so a good bit less than we do now, though. We’re probably sacrificing too much of our harvest and not doing enough resuscitation. Point taken. I’ll try to move closer to the substance of your post. Regarding purpose: in the context of this discussion, I believe [“clearly” :) ] that the purpose for which we are defining identity is to determine which entities have preferences that we should value, i.e. who is a person. Clearly you and I have different identities, and our preferences should be valued separately… but much less clear is whether I am the same person as five minutes ago or five minutes from now, or across my unconscious periods, or after my death. Even less clear, and in fact the key point in this entire controversy, is whether any person’s identity includes the person-moments of people who don’t exist – thereupon hinging the question of whether we should care about the presumed desires to exist of those who do not, i.e. the natalist position. You say “It seems very unlikely to me that people have identities other than ‘collection of person-moments which I choose to define as me’” [paraphrased]. In other words, identity is subjective. I assume here that you mean only that one’s own identity is subjective, i.e. that I can define my identity as ending at death and you can define your identity as continuing on past death once your brain is decanted and uploaded, and that neither of us can gainsay the other’s choice. This may be true. Even so, the notion of subjective identity lends no support to the natalist position. Even if you believe that your own identity includes those non-existent person-moments during times in which you did not exist, the same cannot be said for the hypothetical non-existing people the natalist presumes to advocate for. Even if my moral intuitions obligate me to recognize your existence, and then further obligate me to recognize the personhood of all the person-moments you claim as part of your identity (which I dispute, see below, but accept arguendo for this paragraph), they would not obligate me to recognize the personhood of people who don’t exist. Going further, however: I doubt that identity is subjective. I think a reasonable argument can be made for objective criteria of both identity and personhood. I can’t make it myself, at this time, in this margin. I’m not sure I could make it myself, ever, anywhere, but my meager intellect isn’t the point here. Instead, consider this: most people’s intuitions provide pretty consistent views of what constitutes a person’s identity: it starts near birth, resides in a single body, continues through unconsciousness, and ends at death. Maybe there’s some disagreement on some details, and maybe some people (such as extropians, Robin Hanson, and other alien creatures) disagree in very substantial ways, but there’s pretty strong support for the general picture. Doesn’t that hint at the existence of objective criteria, perhaps even supported with sound reasoning, even if most people can’t readily explain what exactly those criteria and reasons are? There is a difference between people who will exist and people who could exist. I will exist later this afternoon. I care now about that person’s welfare; I want him to have a cold soda to drink, so I’m going to take a minute out of my busy day right now and put one in the fridge. My daughters exist today and will also exist many years from now. I care now about their future selves’ welfare. I’m devoting significant resources now to help ensure they will have good lives, and I support social institutions that will ensure that they benefit from my accumulated wealth even after I am dead (i.e. enforcement of wills and estate law). Hundreds of years from now, humans will exist. I care now about their welfare. I care even though none of them exist today, I will not exist then, and in fact there will never be a time when I and they exist together. I want them to have libertarian governments, moonbases, and flying cars. To that end, I support public policies that aim to minimize government control over individuals and maximize the prosperity of all mankind. Okay, mostly I just read libertarian blogs. But it’s the thought that counts, right? Anyway, the point is that I value the welfare of people who don’t yet exist but who will exist even in the distant future. But I don’t care about the welfare of my next child. My wife and I may have another child, or we may not. We haven’t decided yet. That child doesn’t exist yet. More importantly, that child might never exist. If and when he or she does exist, his or her welfare will be every bit as important to me as that of any other child of mine (i.e. valued beyond life itself). But prior to existence, the non-existent child’s welfare carries zero weight. It’s important to distinguish between the people that don’t exist yet but will, and the people who don’t exist yet but could. The distinction is not simply a matter of probabilities, i.e. there’s a 99% chance I’m not going to die before I drink my soda this afternoon vs. the maybe 30% to 70% chance we’ll decide to have another child. The important distinction is one of choice. Whether the human race exists in the year 2112 is not a matter of my choosing; whether our next child exists is. Regardless of what I do today, humans will be there a hundred years from now; I should act to ensure their welfare. But I have no obligation to act to ensure the welfare of my next child if I choose not to have another child, because in that case there will be no child to maximize the welfare of. More critically, even choosing not to have the child does not fail to maximize the welfare of the child, because there will be child to maximize the welfare of. A non-existent rock has no mass, no matter how big it isn’t. Since I brought up our next-child decision, I might as well add another point to the natalist debate in general – although this is a big diversion from your main post. We look at our daughters and see how happy they are. Intuitively, it seems like adding happy people to the world is a positive act. In fact, it’s pretty hard to say otherwise. Right? If the rest of the world is no better off from their existence, but they themselves are happy – was their creation a positive act? The intuitive answer is “yes”, but I believe the intuitive answer is massively biased due to the nearly impossible act of imagining one’s children to have no value to anyone but themselves. The intellectual answer is of course the topic of the present controversy. I think, however, that those who answer “yes” are laboring under a distorted view of utility, as if it were a substance like water or sand, whereby each happy person has some number of utilons, and by creating more people and making them happy you’ve made a bigger pile of utilons and thus made the world a better place. I don’t think that’s the right view of the world. I think that if you add a happy person but don’t make any of the rest of the people happier in the process, you’ve not made the world a better place. You’ve only made it bigger. I don’t think the fact that you have identified a problem with the common view of personal identity lends any support to your view of population ethics. Why the assumption that preferences matter more than experiences (or that they should be given any credit at all, for that matter; I don’t think it’s controversial to claim that people have irrational preferences all the time)? I agree that people are just a collection of person-moments, but if we should justify current actions by future preferences, would it be okay to torture someone (which they would still experience as horrible and painful) if you can simultaneously impart a preference for being tortured to them? That cake metaphor was personally painful for me. It reminds me of that time in 1782 when I didn’t get born. Everyone was all like “But we didn’t know you wanted to be alive” and I was like “It would have been a pretty reasonable inference” and so forth. An ugly time. Things are better. Nowadays, when my friends are having a yummy snack while I’m asleep, they do the conscientious thing and murder me so I can’t feel envy in the morning.